Dogs like Chief Rabbi Yitzhak Yosef is the reason why Israel is one the most hostile countries in the world towards Black people. 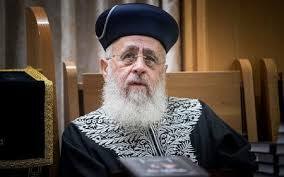 AFRICANGLOBE – The Sephardic chief rabbi of Israel called Black people “monkeys” during his weekly sermon on Saturday evening. Rabbi Yitzhak Yosef, a notorious hate preacher was addressing Jewish legal aspects of the blessing on seeing fruit trees blossoming, during the current Hebrew month of Nissan, and, specifically, whether one should bless one tree or at least two. His office told reporters that the comparison was a quote from the Talmud.